After buying a licence you will need to enter your details and code. 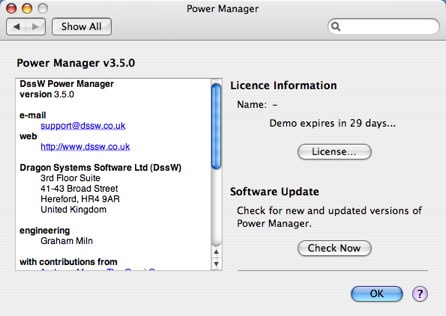 This button displays a window for you to license Power Manager. Power Manager can check for new versions and updates of itself. Clicking this button fetches a file of current version information from the DssW web site. Your version is then compared with the current version. If they differ, you will be given the chance to download the latest version. No personal or identifying information is sent with the version check request. The OK button closes the About Power Manager view and returns you to the main list of events.